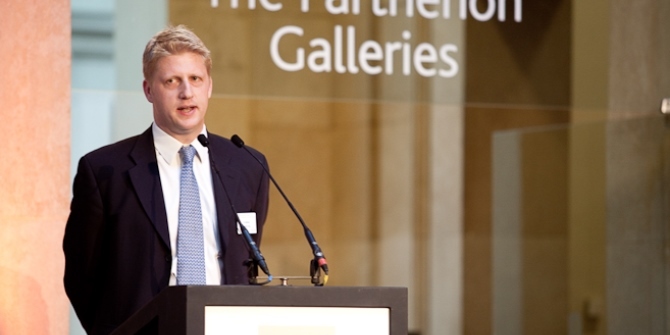 Speaking earlier this month at the Universities UK Annual Conference, the Minister for Universities and Science, Jo Johnson, offered few new pointers about the upcoming Teaching Excellence Framework (TEF) but may have revealed more – not necessarily intentionally – about the government’s broader view of the Higher Education sector. 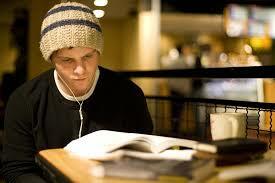 Take the comment about new providers’ courses being validated by established universities. 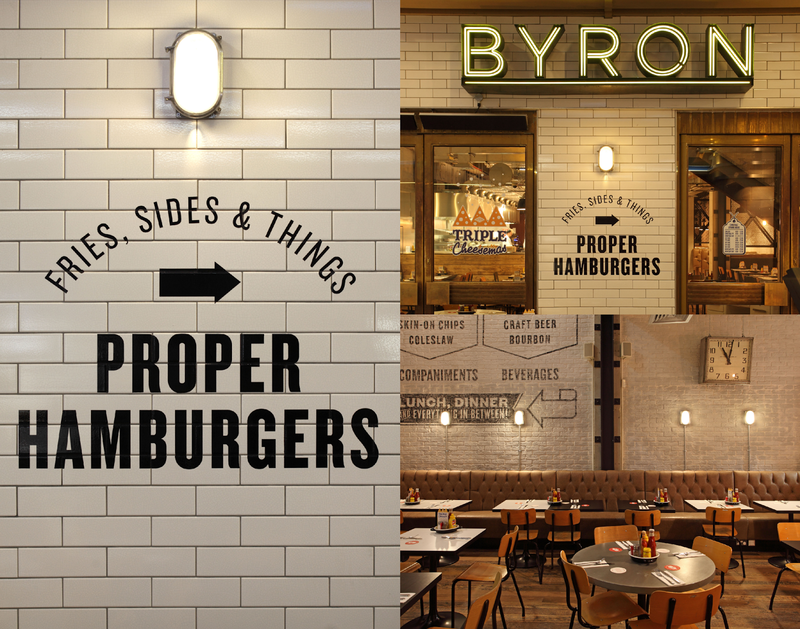 According to the Minister, it’s “akin to Byron [Burgers] having to ask permission of McDonald’s to open up a new restaurant.” The point being made is clearly about perceived anti-competitive practices, with eager young upstarts being denied market entry by larger, entrenched operators. However, the metaphor is a curious one, with the new providers framed as purveyors of posh hamburgers and their validating institutions as lower-end fast-food joints. Nick Hillman cleverly traces the root of the analogy to Matthew Batstone, co-founder of the New College of the Humanities, whose favoured version was more confectionary: Batstone likened the validation process to new chocolate bar manufacturers needing approval from Mars Bar. However, as John Gill notes, “high-profile problems have dogged attempts to inject competition” into the Higher Education arena. And though some alternative providers have targeted Byron’s end of the market, not all private colleges have been made of the finest ingredients, as investigations by Andrew McGettigan and others have shown. Also revealing was Johnson’s definition of inspiring academics as those “who go the extra mile, emailing feedback at weekends and giving much more of their time than duty demands”. Within the sector, eyebrows lifted at the expectation that university staff should work harder still, and the implication that their weekends aren’t already spent on the job. Some wondered whether excellence within all professions would now be judged on out-of-hours contributions, and questioned why academics’ work-life balance was being further eroded. Remember that 40% of university teaching staff are on temporary or zero-hours contracts, and that university management is plagued by gender imbalance. But the definition was probably born more of frustration than disrespect. Finding TEF metrics that actually work has proved trickier than anticipated. Learning gain might (and probably should) be measurable at local levels for individual cohorts of students, but it doesn’t allow the kind of cross-institution and cross-discipline comparisons that the TEF craves. Employability and salary data tell you lots about students’ background characteristics but, as Graham Gibbs notes, they remain hopelessly distant proxies for the quality of teaching they received at university. Elsewhere, the Minister’s speech did offer some optimism for the sector’s future. The goal of increasing by 20% the number of black and minority ethnic students going to university by 2020 is to be applauded. UCAS was ordered to publish more detailed breakdowns of candidates’ background characteristics and application patterns, as the Social Mobility Commission requested some time ago. 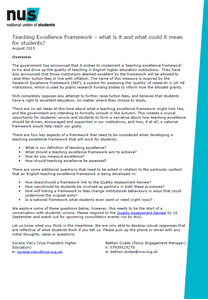 There were even intimations of a lighter-touch Research Excellence Framework (REF), with welcome acknowledgement that many in the sector want an audit that is “less bureaucratic and burdensome” and which “takes up less of the time that could be spent more fruitfully on research and also, of course, on teaching”. Keeping the sector on side remains the TEF’s biggest challenge. Mike Hamlyn rightly worries about higher education “being seen as a transactional good, rather than a transformational experience,” while Paul Martin Eve fears that the TEF heralds “a massive coming wave of shake-ups to Higher Education finance, both research and teaching”. Pleas to rebalance teaching and research may seem more reasonable to academics if excellence in the former was acknowledged to rely on excellence in the latter. Disappointingly, the student voice is fading from TEF debates, with the NUS executive electing for “principled disengagement” because of threatened links with an inflationary fee rise. This despite the NUS having previously issued an excellent briefing paper on the topic. The full title of the Minister’s speech referred to “fulfilling our potential”. The challenge ahead is to ensure that “our” embraces the whole of the Higher Education sector, and that “potential” denotes opportunities for it to become more equitable, more pedagogically responsive and more transparent about what it does. Greater care should be taken with language. How exactly is “patchiness” in the student experience being differentiated from learner-appropriate pedagogical diversity? Who exactly is lamenting the “lamentable” teaching? That “extraordinary teaching deserves greater recognition”, however, is incontrovertible. As is the claim that Higher Education is “the most powerful driver of social mobility we have”. The TEF will soon find friends in the sector if it nudges institutional cultures in this kind of direction. But equally important is that the TEF skirts avoidable pitfalls, in terms of both policy and rhetoric. Such pitfalls include hierarchy-enshrining outcome indicators, student-alienating associations with a fee hike, and tortuous metrics that reward only the wiliest gamers. The sector may also have had its fill of burger metaphors. This entry was posted in HE Marketisation, HE Policy, Metrics, Participation, Teaching and tagged Collegiality, Excellence, Jo Johnson, Language, NUS, REF, Sexism, TEF, Work-life Balance. Bookmark the permalink. ← What can the TEF can learn from the REF?